(Makes 5 gallons) When we developed this stout over the years we were going for a flavor that was similar to Guinness but with reduced bitterness and more malt flavor. We use 1 lb of Roasted Barley and leave out the Chocolate and Black Patent found in many stouts. This provides for a very clean, precise dark malt flavor. We always talk customers into this kit and they are always thankful we did. Our best selling stout recipe. Previously brewed. Turned out exceptional. Made numerous times and is always good. 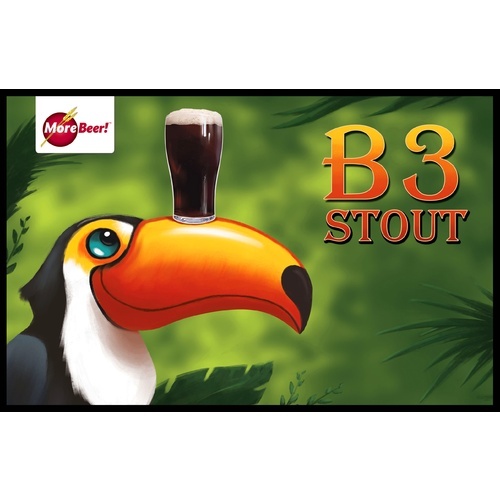 B3 Stout is a great beer to brew ! Has anyone used 1084 instead of 1056? Or better yet, done a comparison between the two yeasts with the B3 kit? Brewed this 6 months ago. This was one of the easiest kits I brewed and I was blown away how amazing this tasted. Everyone I shared this beer with said it was their favorite one made by me and wanted more.Very similar to a foreign dry stout. I used Safale US 05 and it gave a clean finish, allowing the malts to give their flavors. This was the first beer I ever brewed, in Jan 2018. Whole process went off without a hitch. Lasted on my shelf less than a month based on the popularity with my friends, but I could tell the subtle hop flavor on the finish slightly mellow over that time, making the beer taste even better (in my opinion). I used the WyYeast 1056 American Ale. It's a bit dry with WLP001 California ale but I like the taste (and dryness). Awesome recipe! I love stouts and this is honestly the best one I've had. Even a friend of mine who has been brewing for about 20 years said it was the best one he has ever had. It has a nice black color and rich head that lasts without the strong coffee flavor. Very smooth and drinkable. I'm nearing the end of my bottles on this one and will be ordering another batch soon. I add some cocoa powder to this kit to make my "half-asphalt cocoa stout." Beer lovers and snubbers both like it. Excellent stout,very neutral, great tasting by itself or with additions. My favorite stout. Also great with Cherry juice or huckleberry juice added to secondary fermenter. I brewed this for my very first batch, and it turned out great. I shared it with about 10 friends and they were shocked at how good it was. It's got a creamy mouthfeel and good head. My OG was high at 1.068 so the beer came out around 6.5% abv. I used Wyeast 1056 American and the finished product tasted like an Americanized version of Guinness, but without that famous tart/sour tinge. Overall I prefer the normal Stout kit better because of the chocolate and patent malts that are included, but this B3 version is definitely worth brewing. This is what a basic stout should be. Period. It's a fantastic base to start with. I my case I used the kit as-is, except I added 3 "servings" of coffee made in an AeroPress to secondary. This is equivalent to around 6-7 shots of espresso. This gave a great coffee flavor without being too distracting. My wife normally doesn't drink my beers, since I usually brew hoppy styles that she doesn't like, but she really enjoyed this one and actually would pull some pints for herself once every few nights, which is a first. 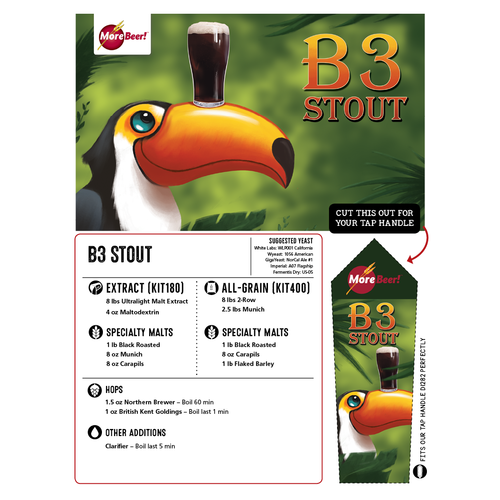 I'll definitely be buying the B3 stout again, and along with the M-83 IPA MoreBeer kits haven't let me down yet! Nice stout. Not too hoppy. Added Mexican chocolate at flameout. Came out nice. Friends love it. Has a nice creamy head and dark caramel color. Definitely a strong stout and very close to Guinness. Mine had coffee undertones that I don't taste in real Guinness but this did not detract from the fine flavor. Beautiful color and lacing in the glass. Pretty heavy yeast sediment in the bottle but otherwise clean (not that you can see through this one - its as dark as night). Very satisfied. I used WL-001 rather than an English strain as I was not as fond of another brew where I used WL-002. I added a container of quaker oats to the beer during the grain steeping step. The resulting oatmeal stout is hands down the best homebrew that I have made. 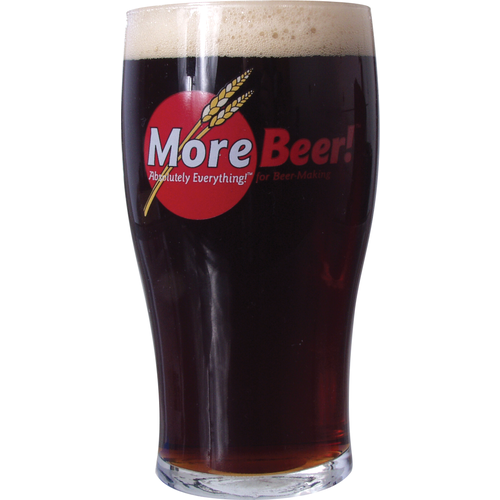 I brewed this as my second beer and the staff at the more beer showroom recommended I try the new dark malt extract. It turned out great and in my opinion better then Guinness. I brewed a second batch 6 months later and used the ultralight extract on the recipe guide. I found it made the beer thinner and more like a porter in flavor. In summary use the dark malt extract to replace the ultralight. Very simple but delicious. 3 weeks in fermenter then bottled. Couldn't wait so threw a couple bottles in fridge only 3-4 days after bottling- was great then, even if a little flat. After about 8 days- just great. Nice head, great flavor. Will definitely order again. I brewed this adding 1 lb of flaked oats to the grains and a 3 lb can of Raspberry Pur?e to the primary ferment. The result is an amazing Raspberry Oatmeal Stout. I've also enjoyed this kit as sold, it's a treat. I brewed this as my third brew (now I'm up to 11), and many say this was their favorite. Simple, but delicious. Kicks the pants off Guinness in a side by side taste test. Delicious creamy head and rich smooth malty goodness. Ordering another right now. Now on my 5th batch. This has surely become my 3-season house beer. Summers I don't drink much stout. I am a lazy brewer. I don't want any hassles or troubles. This one is stupid easy and has been so consistent. Just ordering another, along with a Sunset to try. Cancel the trip to Ireland! Brewed this back in December and keg'd it just before Christmas. I was really impressed with this beer. It is smooth, full flavored, and well balanced. I used the recommended White Labs yeast. Did a full boil along with primary and secondary fermentation. I knew I was in for a treat when I tasted it warm and un-carbonated and already liked it. I was in Ireland this past year and really enjoyed the Guinness in the pubs. When I got back to the states, I was so disappointed with the Guinness in the bars that I figured I'd have to go back to Ireland to get that wonderful stout taste. Not so! This beer is awesome and I just ordered another kit since the first batch lasted less than two weeks. I'll be putting it on Nitrogen this time. :-). No need to go to Ireland as long as this kit is available. I'm typically not a stout drinker and tend toward the brown ales. However, this beer is so good that almost anyone would like it. I'll even go as far as saying I believe it is better than Guinness. Cheers to the designers at Morebeer.com for this one! Brewed up really nicely, even after just a couple of weeks in the keg it had a great flavor - rich, creamy and surprisingly like a draft Guinness considering it's on CO2 rather than Nitro, but with a better "bite". A sturdy, solid stout. Notes of Chocolate, and very tasty! A nice beer to unwind with friends on crisp New England winters, or watching a football game. I really enjoyed this stout and it was easy to brew. I ordered this for my second brewing attempt. Instructions were easy, fermenting was quick and aggressive. I took some to local brew club tasting (2 weeks in primary, 6 weeks in bottle). No one could believe it was just my 2nd brew attempt. Beer had a great head and taste was spot on. Already have requests from friends to brew this one again. After trying Left Hand Brewery's Java Lava I wanted to try to make something to match. Let me tell you, it came out Great! I used this kit and added 2lbs. of DME Golden Light to increase my O.G. I also added 2 cups of my favorite coffee brewed at twice the strength. I dumped all my wort along with the trube into my primary bucket so I can as much oxygen into the wort and then pitched Two packs of Safale S-04 (11.5g). I then fermented it at 68F for 5 days then I pitched my coffee and wort into my secondary. I then fermented it at 70F for additional 10 days. After that I put it into my keg and added 20psi for two days. What a Great beer! Super creamy head and great aroma. Will be entering this into our home brew club. This was the 2nd brew I ever made, and it turned out really good. Not hoppy at all, personally I like beer with some hop taste to it, but all of my friends and family liked this better because of the lack of hops flavor. I will probably make another batch at some point. I spent so time in Ireland last year and it inspired me to get back into brewing. I drank a kot of guinness, but for a change I really enjoyed Murphy's. Whne I got home I wanted to have something similar, and invested in a nitro tape. This beer is amazing on nitro, especially if you like a slightly sweet stout with notes of cholcolate. If you do nitro, I recommend this stout. Excellent beer, exactly as advertised. Has the flavor of Guinness with reduced bitterness. I added my bottling sugar to the wort, since I?m kegging. I?m showing an alcohol content of 6.3%. I?m not sure if this is accurate or not, but it sure seems to have a pretty good kick. I?ve also noticed it?s fairly drinkable and not as filling as Guinness. This will probably wind up as my House Stout?. How about adding 1 lb. of Belgian Candi Syrup Dark2. Would that make it too sweet?